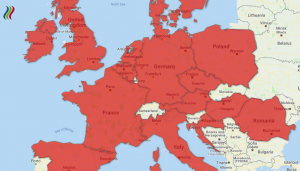 Using this map, you can download a variety of resources linked to specific countries in Europe. By clicking on the of your interest you get a list with the downloadable material. Included are some reports and maps made by other parties, where indicated. If you wish your maps to be included too or add a link, please contact us. Throughout the Heat Roadmap Europe projects, maps have been produced both at a European and at a national scale. For more information on how to use the maps, including the interactive Pan-European Thermal Atlas, watch the Video Tutorial for Using the Maps (10 minutes). 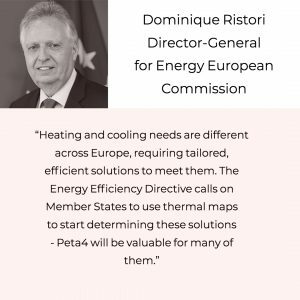 The 4th Pan-European Thermal Atlas covers the 14 EU countries that are part of the Heat Roadmap Europe 4 project and together comprise about 90% of the EU’s total heat market. 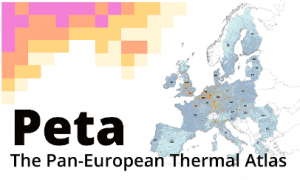 Peta, which is freely accessible, provides specific and realistic heat demand data relevant to energy planning and to facilitate the development of those conditions across Europe which can drive District Heating and Cooling solutions promoted by HRE4. The classification of heat synergy regions can greatly facilitate you in planning priorities to decarbonise across regions. You can also discover which excess heat and renewable energy sources are just waiting to be exploited in your own area. Now you not only have access to the previous cutting-edge grid of modelled heat demand from before, but also a new 100m-resolution grid portraying urban cooling demand densities. Building on previous mapping of district heating systems you’ll be able to identify even more prospective supply areas, each classified by heat demand densities. Finally, in order to exploit these demands effectively, you can now pinpoint where would be the most cost-effective for implementing district infrastructure in your city. Read the user manual to uncover more information. Here you can watch an overview of some key features in version 4 of the Pan-European Thermal Atlas, which is freely accessible from here.